March 18, 2016 By This post may contain affiliate links. 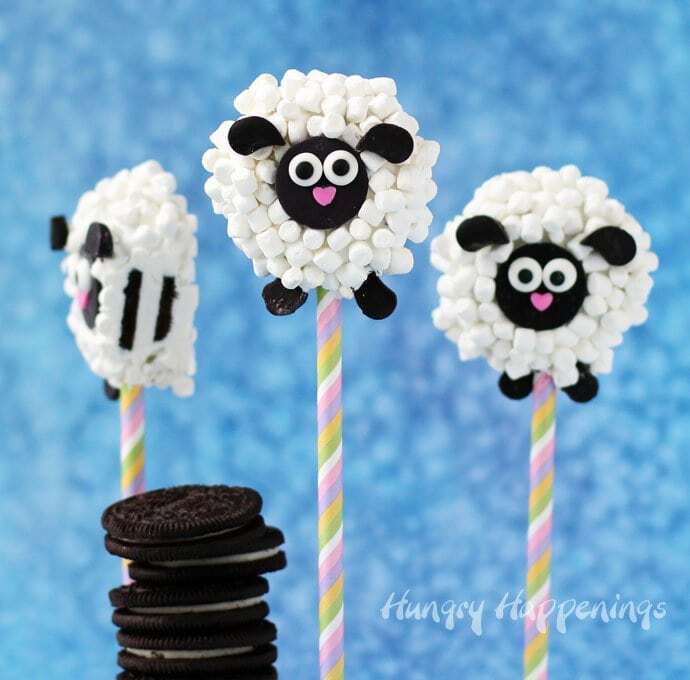 This Easter you won’t be able to resist adding some of these delightful Oreo Lamb Lollipops to your Easter baskets. Each treat has a crunchy chocolate vanilla sandwich cookie dipped in white chocolate and is coated in fluffy mini marshmallows. They taste as sweet as they look. Isn’t that what you just did when you saw these incredibly cute treats? Won’t your kids do the same on Easter morning when they find them in their Easter baskets? I am so blessed to be able to spend my days creating cute treats to share with you and when I make something that makes me squeal I just know you are going to love it too. Yesterday, when I created these sweet little Easter treats, I couldn’t contain my enthusiasm. 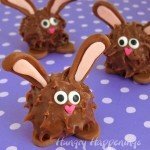 They now top my list of the cutest treats ever created in my kitchen. I realize that list is getting long, but seriously, I am so in love with these little guys. 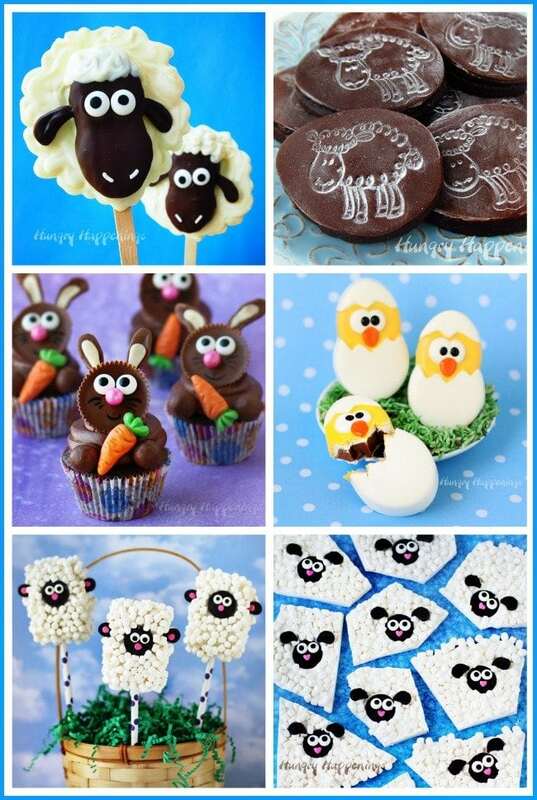 Each woolly little lamb has an Oreo cookie center coated in white chocolate and loaded with tiny little marshmallows. Then it’s decorated with a black candy melt face and some tiny candy melt ears and legs. 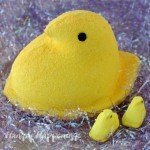 I know you are going to rush out to grab everything you need to make these to put in your Easter baskets. How could you not? 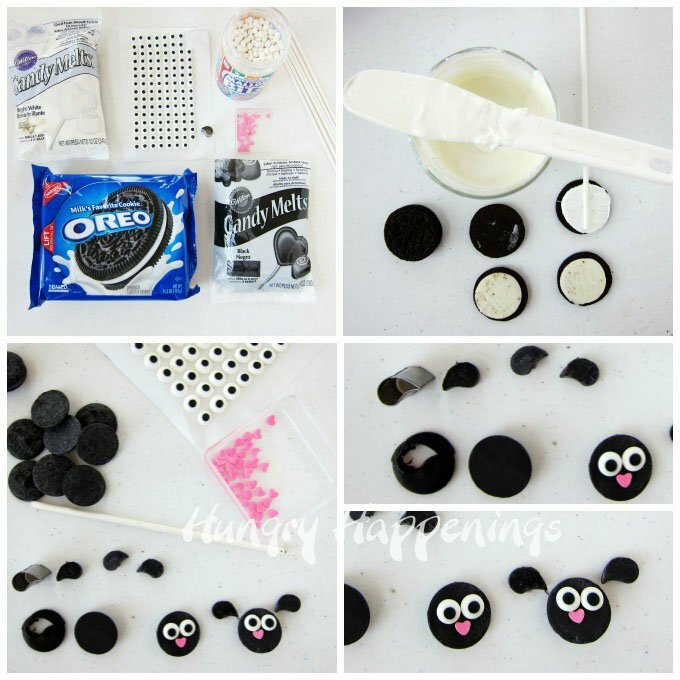 To make your own Oreo Lamb Lollipops, start by separating your Oreo Cookies. I run a thin knife along the inside of one of the chocolate cookies, to get a nice split. Then brush each side of the Oreo with either melted and tempered white chocolate or melted white confectionery coating. 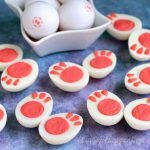 I used Bright White Candy Melts to make mine. 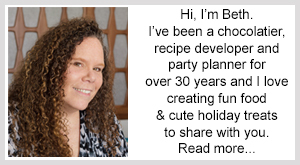 If you’d like more instructions on choosing and melting chocolate or confectionery coating (candy melts,) see my Chocolate Making Tips page. Press a lollipop stick into the wet white chocolate and immediately press the two halves of the cookie back together. Then let the white chocolate harden. While that’s happening, you can get busy making your sweet little lamb faces, ears, and legs. The faces are so easy. Just attach two candy eyes and one pink heart sprinkle nose to the flat side of some black candy melts using the melted white candy coating. If your black candy melts have white scratch marks all over them, rub them against the palm of your hand, smoothing out the scratches. They will be nice and black again. For the ears and legs, you’ll need a very small tear drop cutter. (affiliate link) I used the half inch long tear drop cutter from the Autumn Carpenter’s Fondant Cutter set. Cut out two ears and two legs for each lamb. 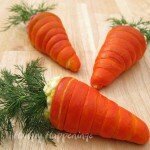 If you don’t have the cutter, you can melt some black candy melts and pipe the tear drops onto a parchment lined baking sheet and freeze them, then peel them off, to use instead. Dip each Oreo lollipop into the melted white chocolate, remove and allow the excess to drip off. Then set in a big pile of tiny marshmallows. Set one lamb face in the center of the Oreo and toss marshmallows all over the cookie. Let the cookie sit for a few minutes before moving to a parchment lined baking sheet. Allow the chocolate to harden for 15 minutes. You can find these tiny marshmallows (Jet-Puffed Mallow Bits,) in the grocery store, usually near the hot chocolate, but sometimes near the marshmallows. 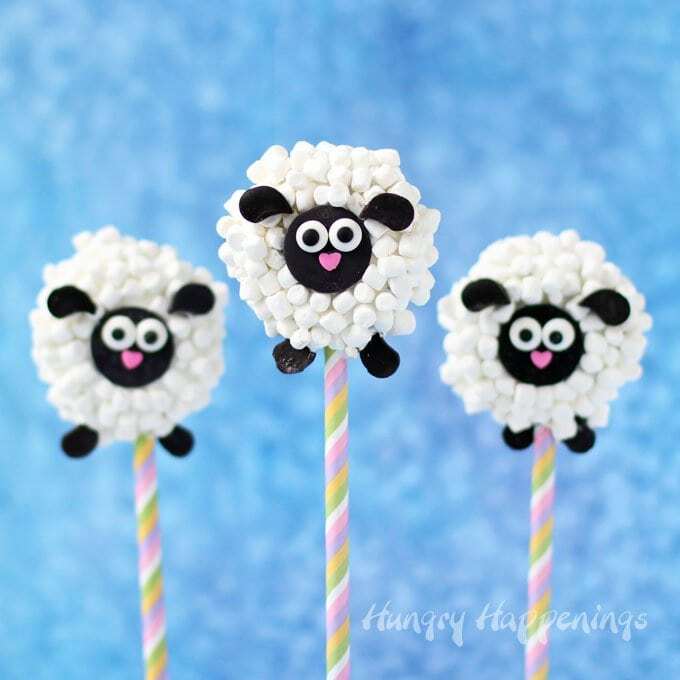 They are the perfect size for these lamb pops. Use melted white chocolate to attach two ears and two legs to each lamb pop. To get the feet to stick in just the right spot you may need to remove one of the tiny marshmallows. Dip the tip of the tear drop shaped leg in white chocolate and press it onto the marshmallow coated cookie. Hold it in place until it sticks. I thought my lollipops would look cute with colorful straws over the lollipop sticks, so I dipped the bottom end of my stick in some white chocolate and slid the straw over top. The chocolate helps to keep the straw secured in place. White chocolate dipped Oreo cookies are coated in white chocolate and lots of tiny marshmallows then decorated with chocolate lamb faces, ears, and legs. Split Oreo Cookies in half. Brush a thin layer of white chocolate on the inside of both halves of the cookie. Immediate press a lollipop stick on one half and press the halves back together. Allow the white chocolate to harden. Attach two candy eyes and one pink heart sprinkle nose to each of 6 black candy melt wafers using the melted white chocolate. Cut two small tear drop shapes out of each of the remaining 12 black candy melts creating 12 lamb ears and 12 lamb legs. Dip an Oreo lollipop in white chocolate. Press one of the chocolate wafer lamb faces in the center. 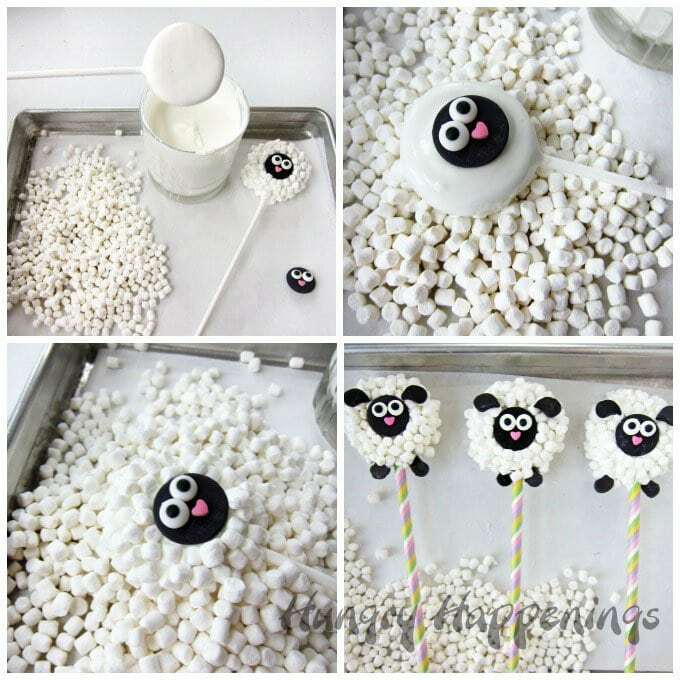 Repeat, creating 6 Oreo Lamb Pops. 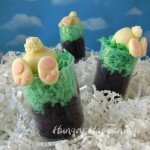 Use melted white chocolate to attach two chocolate ears and two chocolate legs to each lamb pop. These are so cute Beth. Oh Beth, I am in love with these little lambs, coated in marshmallows! Couldn’t wait to see the photo when read the title!! I’m so glad to hear your are in love with them too. I almost couldn’t part with them because I just wanted to look at them every day. In the end, I did sell them to a customer. She was thrilled. 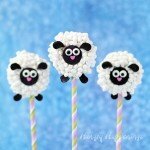 I can SO see why these top your favorites list..what an adorable bunch of little lambs! I haven’t been in my kitchen much lately, but I’m gonna have to change that. Honestly Beth, I can see why your customer was so thrilled! Thanks, Karen, that’s so nice. I love that I can create new and fun things to sell to my customers instead of the same candy year after year and they love it too. How long do they last once made? 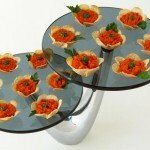 They should stay fresh for a few weeks if stored in an airtight container. If you wrap them and leave them out in the air, they’ll be good for over a week.